Home » Contests » 2011 Halloween Contest Winner! A winner for our 2011 Halloween Contest winner has just been picked and her name is Christine Chapman Birch. Congratulations from all of PromotionalCode.ca’s team for winning a $50 coupon code to use at BuyCostumes.com. Her plans for Halloween are classic. She is planning to have a pumpkin carving party where she will be dressed up as Alice in Wonderland. We want to take this opportunity to thank everyone who has participated in this Halloween giveaway. Some really good ideas were shared, from Alex who wanted to dress up as a dwarf to Mandy Cleaveley who wishes to dress up as Robin Hood. Check out our Facebook page if you want to have a look at what happened during this giveaway. Also, thanks a lot to BuyCostumes.com for partnering with us for this giveaway. 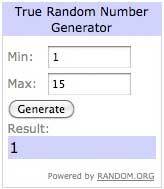 Please note that the winner of this giveaway was chosen entirely randomly using the Random.org random number generator.